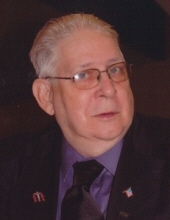 Edward E. Ellebrecht, age 72, of Owensville, Missouri passed away Saturday, January 26, 2019 at Harry S. Truman VA Hospital in Columbia, Missouri. This is a final salute for Edward E. Ellebrecht. Edward Ervin was born on May 21, 1946 in St. Louis, Missouri, to Elmer Henry and Faith Mary (Dietrich) Ellebrecht. Specialist 4rth Class Ellebrecht served in the United States Army from June 22, 1964 to June 21, 1967. During his military career, he served as pay specialist, classified courier, and jeep driver. He earned the Vietnam Service Medal with one Bronze Star, the National Defense Medal, the Republic of Viet Nam Campaign Medal, and also earned rifle expert. He was raised in St. Louis and worked as a Draftsman for a Glass Manufacturing company, as well as for Couples. Ed also owned and operated Sense & Treasures in Bloomsdale, MO. Ed and Sabine were married on October 25, 2015 and made their home in Owensville sense 2009. He enjoyed fishing and camping, working puzzles, reading western books, and ceramics. Ed will be lovingly remembered and missed by his family and friends. He moved into the Missouri Veteran’s Home in St. James, MO, on November 15, 2016 and it has been their honor and privilege to care for Specialist 4rth Class Edward Ellebrecht. Edward is survived by his wife, Sabine “Sue” Ellebrecht of Owensville, MO; four children, Lisa Corser of South County, MO, April Rainwater and husband, James, of Hillsboro, MO, Joshua Ellebrecht and wife, Gina, of Gerald, MO, and Angel Payne of Owensville, MO; his mother, Faith Ellebrecht of House Springs, MO; one brother, Harvey Ellebrecht and wife, Maury, of House Springs, MO; one sister, Chrystel Ellebrecht of Arkansas; six grandchildren, Samuel Ellebrecht, Levi Ellebrecht, Haley Rainwater, Megan Rainwater, Emma Rainwater and Noah Rainwater; other relatives and many friends. He was preceded in death by his father, Elmer Henry Ellebrecht; and one sister, Donna Henderson and husband David. Graveside services with full military honors will be held 10:00 AM, Friday, February 8, 2019 at Jefferson Barracks National Cemetery in St. Louis. A Celebration of Life Gathering will be held at 4:00 PM, Friday, February 8, 2019 at Calvary New Life Tabernacle in Gerald. 104 W. Industrial Dr., Gerald, MO 63037. Reverend Shelia Bowens will officiate. Friends may send online condolences to the family of Mr. Ellebrecht at www.eatonfuneralhome.com. To send flowers or a remembrance gift to the family of Edward E. Ellebrecht, please visit our Tribute Store. "Email Address" would like to share the life celebration of Edward E. Ellebrecht. Click on the "link" to go to share a favorite memory or leave a condolence message for the family.